CMS is currently implementing bundled payments through the Bundled Payments for Care Improvement (BPCI) initiative and the Comprehensive Care for Joint Replacement (CJR) model. We discuss each of these programs in detail, as well as providing a guide for radiology practices designing bundled payments. The BPCI initiative has four different models for participating in bundled payments. Providers participating in Model 1 receive bundled payments for all inpatient DRGs associated with acute care hospital stays. Providers participating in Models 2-4 can choose from 48 clinical inpatient episodes. The key differences between the models are listed in the table below (CMS). More details on these models can be found in CMS’ guide to bundled payments and fact sheet on bundled payments. Perhaps the most important distinction to radiology practices between the various models is whether the payments are retrospective payments or prospective payments. Retrospective bundle payments employ a benchmark cost – usually an expected value (mean cost), minus 5 percent. Providers file traditional fee-for-service (FFS) claims and are reimbursed as normal. However, all of the claims reimbursed for an episode are reconciled by payers later by comparing the total episode cost to the episode benchmark rate. Providers share savings with payers but must return portions of reimbursements received that are above the benchmark rate. There are multiple methods for managing the risk for potential losses to providers. Prospective bundle payments reimburse providers with a fixed, pre-negotiated payment for each episodes of care. Providers retain all savings but also must incur any losses that may occur. The Comprehensive Care for Joint Replacement (CJR) model aims to support better and more efficient care for beneficiaries undergoing the most common inpatient surgeries for Medicare beneficiaries: hip and knee replacements (also called lower extremity joint replacements or LEJR). 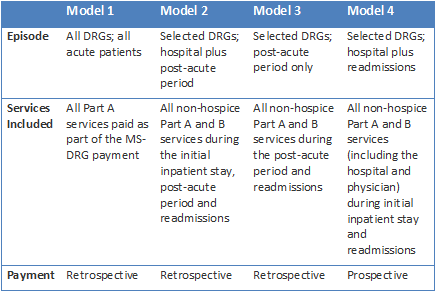 This model tests bundled payment and quality measurement for an episode of care associated with hip and knee replacements to encourage hospitals, physicians, and post-acute care providers to work together to improve the quality and coordination of care from the initial hospitalization through recovery. The proposed rule for the CJR model was published on July 9, 2015, with the comment period ending September 8, 2015. After reviewing nearly 400 comments from the public on the proposed rule, several major changes were made from the proposed rule, including changing the model start date to April 1, 2016. The final rule was placed on display on November 16, 2015 and can be viewed at the Federal Register. Providers will submit claims and be reimbursed as under FFS. CMS will reconcile the total episode costs with the appropriate geographic benchmark cost each year. Hospitals are the responsible provider for all CJR episodes and may receive either an additional payment reflecting episode saving or be required to reimburse CMS for a portion of the spending exceeding the benchmark rate. Radiology practices located in the selected geographic areas are automatically participating in the CJR model and will be reimbursed as normal through FFS payments, with no financial risk to the practice. However, many hospitals are proactively working with radiology practices to develop frameworks to share the risk and reward. If your hospital is seeking assistance from your practice, carefully review the frameworks for radiology participation and our case study for CJR bundles to determine whether and how to work with your hospital in a CJR bundle.